PVC projectile-launchers of all varieties are perhaps the most fun and explosive projects you can easily undertake in your workshop. They're mechanically simple, which makes them wildly approachable, but that doesn't mean they have to be boring. 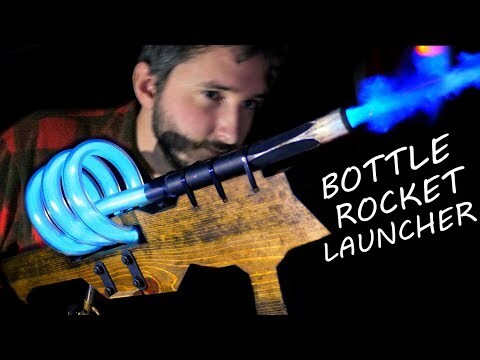 Take, for instance, this beautiful bottle-launcher designed by YouTuber Nighthawkinlight which almost pretty damn sci-fi for a bottle and some tubing. The launcher operates on basic potato-gun principles. A bottle at the end of a PVC barrel is filled with an air-propane mixture which when ignited sends the bottle flying off into the distance with a cloud of flame and a hell of a boom. What makes this particular application so great though is the flourish—the circular path the pilot flame takes, building up some tension before the big event. While this launcher's most showy characteristic is its coiled tube, the most intelligent bit of design is a much smaller detail. The PVC barrel has been modified just slightly around where the bottle's neck fits so that flat portions give the air inside the bottle the ability to escape. Otherwise, the tight seal would keep the pressure inside stable and prevent propane from drifting in. Once the mixture inside the container ignites, however, the bottle advances toward where the pipe is perfectly round and then makes a tight seal and the real magic happens. It's a smart solution to the silly problem but one that looks so fantastic in action.